Rusty McKinney is a native of Greensboro, NC and grew up in a family of professional musicians. He is an alumnus of the Peabody Conservatory in Baltimore, MD where he was a bass trombone performance major. 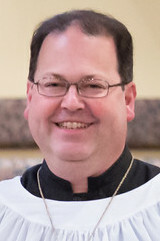 Over a period of 16 years, he served as Music Director for Mount Tabor Lutheran Church in Salt Lake City, UT, First Presbyterian Church of Salt Lake City, White Plains United Methodist Church in Cary, and Oakland Presbyterian Church in Clayton, prior to his appointment as Minister of Music in 2015 here at St. Paul’s Church. Rusty was the bass trombonist of the Utah Symphony Orchestra for 22 years. He has also held orchestral positions with the Chattanooga Symphony, The Eastern Music Festival, and the Saint Louis Symphony Orchestra (interim bass trombonist). Rusty has been a guest musician for the Kennedy Center Orchestra, the National Symphony Orchestra of Washington, D.C., the Baltimore Symphony, and most recently the Pittsburgh Symphony Orchestra. He is a frequent guest musician with the North Carolina Symphony and plays with the North Carolina Opera Orchestra and other top tier ensembles throughout NC. As a music educator, Rusty has held adjunct positions at the University of Utah (Associate Professor of Trombone), Brigham Young University (Assistant Lecturer of Bass Trombone), and Snow College (Director of Low Brass Studies). He was also the Music Director and Conductor for the Westminster College Chamber Orchestra in Salt Lake City. Rusty is married to Linda, who is an alumnus of the Peabody Conservatory and Meredith College. She works as a paralegal at a Raleigh law firm and is a member of the St. Paul’s Choir. They have three grown children and two large cats.